May Bike Party 5/29 – Prom!! hey folks, it’s that time of year again! 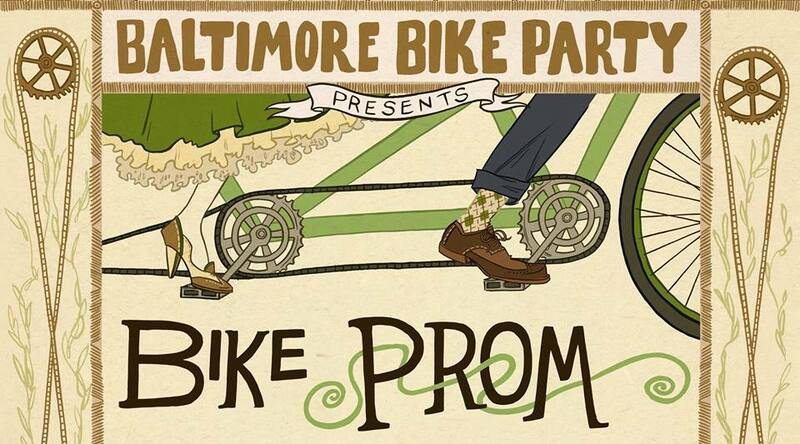 Grab your tux, dress, date, and bike and come help spread the love in our wonderful city! This month we will be riding through the west side and ending at Lexington Market. 2) We will be riding under WEST COAST RULES, stopping at red lights. What does that mean? Read THIS please!!!!! 5) PARKING: We encourage everyone to BIKE to the event, but if you are coming from out of town, please park near the after party! You can park in the LEXINGTON MARKET GARAGE, which is the 2-story garage on Paca street across from the market! Other garages in the area *MAY* close early! From there, it’s a short 4 block ride up Paca to the starting point. 6) AFTER PARTY: We will be ending this month at Lexington Market! There will be lots of yummy food from market vendors as well as the usual beer, wine, dancing, photobooth, etc! 7) For those new to Bike Party, you must purchase TICKETS at the ticket table in order to get drinks! 1 ticket = 1 drink. Tickets are $4 each or 3 for $10. Cash is king. There is an ATM at the market (inside) or we can accept cards at the ticket table, but cash will get your tickets quicker! 9) When you arrive at the after party, please PUT YOUR BIKE INSIDE THE CORRAL. Bikes locked up outside of the fenced-in lot are MUCH more vulnerable to theft! Read more about how to lock up here. 10) Don’t forget to dress your best to get crowned as prom royalty!